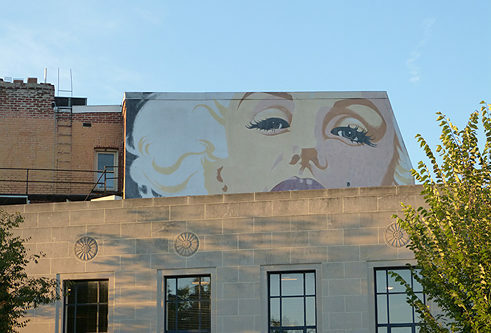 At an intersection in D.C. neighborhood Woodley Park, pop-icon Marilyn Monroe gazes down on tourists and locals alike. She graces the walls of Salon Roi, a hair and beauty institution in the city since 1969. The mural, one of the oldest and most popular ones in the city, was commissioned for owner Roi Barnard’s 40th birthday in 1980. Portrait artist John Bailey finished the piece in 1981 and, with the support of the Woodley Park Neighborhood association, restored it to its old glory in 2001. After a rejuvenating treatment of fresh paint and new floodlights, Marilyn continues to delight the neighborhood with her timeless beauty. John Bailey has degrees in art from the University of New Mexico and George Washington University, and became a self-employed artist after having taught all grad-levels for twelve years. With his drawings, painting and constructions, he explores multi-dimensional surfaces, the subtleties of personality, the sensuous grace of the human body and the spiritual/human journey. His art can be described as abstract, allegorical, surreal and super-real.